Citation Information: JCI Insight. 2019;4(1):e124233. https://doi.org/10.1172/jci.insight.124233. Psoralen plus UVA (PUVA) is an effective therapy for mycosis fungoides (MF), the skin-limited variant of cutaneous T cell lymphoma (CTCL). In low-burden patients, PUVA reduced or eradicated malignant T cells and induced clonal expansion of CD8+ T cells associated with malignant T cell depletion. High-burden patients appeared to clinically improve but large numbers of malignant T cells persisted in skin. Clinical improvement was linked to turnover of benign T cell clones but not to malignant T cell reduction. Benign T cells were associated with the Th2-recruiting chemokine CCL18 before therapy and with the Th1-recruiting chemokines CXCL9, CXCL10, and CXCL11 after therapy, suggesting a switch from Th2 to Th1. Inflammation was correlated with OX40L and CD40L gene expression; immunostaining localized these receptors to CCL18-expressing c-Kit+ dendritic cells that clustered together with CD40+OX40+ benign and CD40+CD40L+ malignant T cells, creating a proinflammatory synapse in skin. Our data suggest that visible inflammation in CTCL results from the recruitment and activation of benign T cells by c-Kit+OX40L+CD40L+ dendritic cells and that this activation may provide tumorigenic signals. Targeting c-Kit, OX40, and CD40 signaling may be novel therapeutic avenues for the treatment of MF. 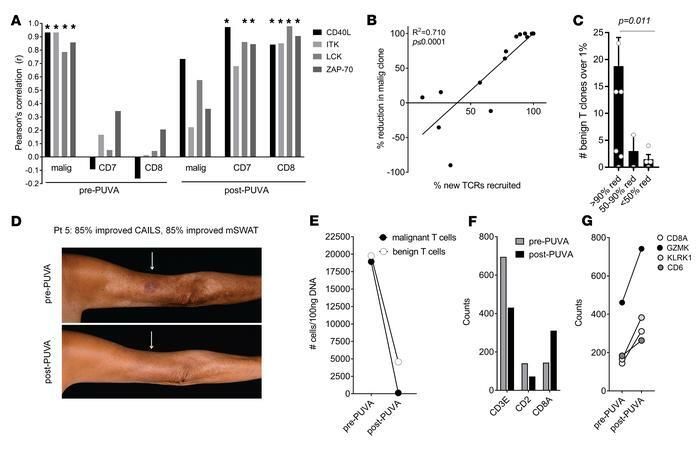 Clearance of the malignant T cell clone after PUVA is associated with recruitment of new CD8+ T cell clones that express markers of antigen-specific activation, are locally expanded, and may be tumor specific. (A) Markers of TCR-dependent, antigen-specific activation (CD40L, ITK, LCK, and ZAP-70) are strongly associated with malignant T cells before but not after therapy and are strongly associated with benign and CD8+ T cells after, but not before, therapy. Expression of these genes was correlated with malignant T cell number (assessed by HTS), benign T cells (CD7 gene), and CD8+ T cells (CD8A gene) before and after therapy. *P < 0.05. (B) The recruitment of new T cell receptors into the tumor is strongly associated with clearance of the malignant T cell clone. The percentage of total T cell clones bearing antigen receptors not seen before therapy is shown on the x axis and the percentage reduction in the malignant T cell clone is shown on the y axis. A Pearson’s correlation coefficient with a 2-tailed P value is reported. (C) Patients who eradicated or greatly reduced malignant T cells had expanded clonal populations of benign T cells after therapy. The number of expanded benign T cell clones making up greater than 1% of total benign T cells after therapy are shown for patients who had a greater than 90% reduction (>90% red), a 50%–90% reduction (50-90% red), or less than a 50% reduction (<50% red) in malignant T cells after PUVA therapy. The mean and SEM are shown; a Kruskal-Wallis 1-way analysis of variance with a Bonferroni-Dunn post hoc test for multiple means testing was used (α = 0.05). The P value is adjusted for multiple comparison testing. (D–F) An illustrative patient (Pt 5) is shown who had marked reductions in clinical inflammation (D), malignant and total benign T cell numbers in skin (E), but an increase in CD8+ T cell–associated genes (F and G). Malignant and benign T cell numbers were determined by HTS (E) and expression counts for T cell–associated (CD3 and CD2) and CD8-associated (CD8A, GZMK, KLRK1, and CD6) genes (F and G) were measured by NanoString.